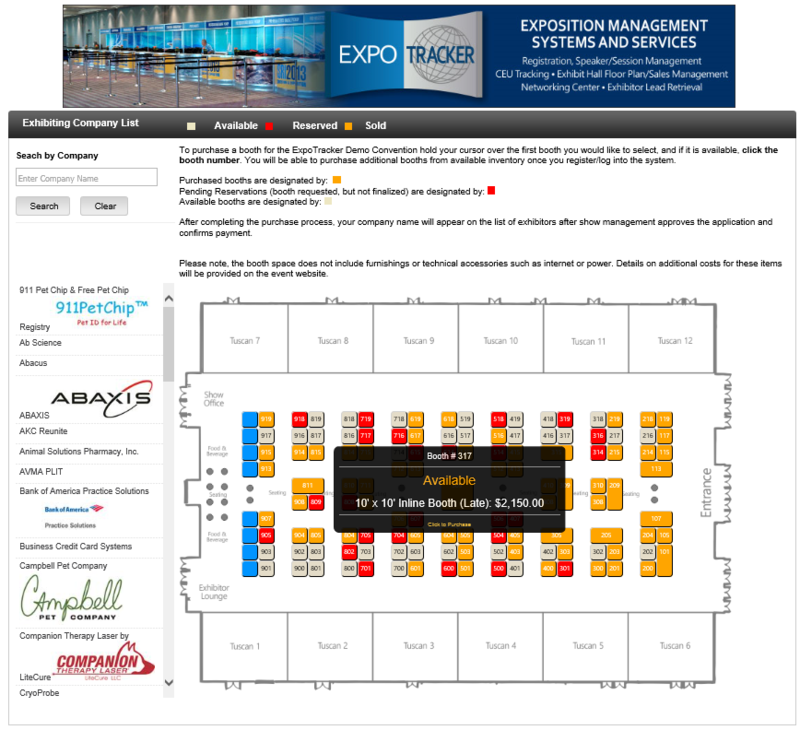 The Expo Tracker Exhibit Sales and Interactive Floor Plan system create a seamless process for exhibitors to view current exhibiting companies, select available booths, and complete the purchase in one quick efficient process. The exhibitor completes the company profile, purchases enhancements to their listings, and adds color logos, directory advertising, mailing lists, and any additional items available for sale. Show management reviews the booth purchases and confirms the booth assignments before they post live on the floor plan. The system creates an interactive display of the entire show floor and a comprehensive listing of each exhibiting company and their profile. Attendees can search for products and services offered by exhibiting companies, and when the Exhibit Sales Center is integrated with the Network Center, attendees and exhibitors can engage in dialogue, share RFP’s and ideas, and schedule meetings in their exhibit booth or at specific locations at the conference. Show management has access to the management portal 24/7 to process check payments, update listings, and manage the entire process. Reporting includes financial reconciliation, booth inventory, and sales totals for each item in the system, and all of the information required to manage the sales process. Show management controls booth pricing and inventory directly through the system. The Exhibit Sales Center provides a quick and easy process for show management to create a printed show directory, with color logos, company descriptions, contact information, and other information collected by the system, by downloading a report. The Exhibit Sales Center integrates with the Registration System and the Housing System, so after the sales process is completed, exhibitors can immediately register their booth personnel and make hotel reservations.